Antigonish is a small town with more than its share of cultural riches, including art galleries, theatres and many cafes. 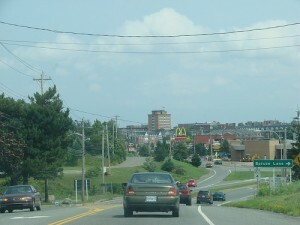 The lively atmosphere is largely thanks to the influence of Saint Francis Xavier university, which calls Antigonish home. It makes a good stop on the road to Cape Breton and the Cabot Trail or on the way to Pictou and Tatamagouche, along the Northumberland Strait. Try to time your visit for a Saturday, when food lovers can visit the farmer’s market (May to December) and music fans can take in a traditional ceilidh at Pipers Pub (every 2nd Saturday, 33 College Street, 2pm-5pm). In July, the Highland Games draw in the crowds to Antigonish. This is your chance to watch kilt-clad men toss the caber and participate in other Celtic athletic events. It’s the longest continuously running Highland Games in North America. Antigonish is also home to a summer theatre, Festival Antigonish, while Theatre Antigonish takes over the stage in the autumn. There’s a performing arts series too at the university between September and April. Just out of Antigonish is Mother Webbs. They’ve been serving up hearty food for nearly 5 decades and the restaurant is conveniently placed right on the Trans-Canada highway.